Rocky Mountain National Park (RMNP) is relatively small park near Colorado’s largest population centers. Founded in 1915, when there were 31,000 visitors, the 416 sq mile national park has been hosting about 3,000,000 visitors a year since 1977. Although only a two hour drive from busy Denver, CO, and often crowded, RMNP, with its four campgrounds, is a beautiful and exciting destination, summer or winter, for the RV or tent camper. There are three main entrances to Rocky Mountain National Park and its gem attraction Trail Ridge Road (US 34). From the east, Beaver Meadows Entrance (US 36) and Fall River Entrance (US 34) are reached in a few miles from the famous resort town of Estes Park. From the west, Grand Lake Entrance (US 34) is not far from the small mountain town of Grand Lake. Major park visitors’ centers are located near these entrance stations. Estes Park is reached from the east through Loveland, CO, by US 34, and from Lyons and Boulder, CO, by US 36. Grand Lake is reached from the west or south from the US-40 exit on I-70 between Georgetown and Idaho Springs, CO. Take US 40 to Grandby and from there on US 34 to the west entrance. The communities of Estes Park and Grand Lake are close-by centers for lodging, fuel, supplies, and public and private campgrounds outside RMNP. Rocky Mountain is a high elevation park with roads reaching 12,183 ft on Trail Ridge Road (US 36) and trails as high as 14,259 ft on the East Long’s Peak Trail. These elevations mean that weather may change rapidly and it may snow any month of the year. Note that Trail Ridge Road (US 36) will be closed during winter and may be closed for short periods even in summer. Summer in RMNP’s will also bring afternoon thunder storms that are often very violent in the higher elevations. Be sure the clothes and gear you bring reflects these extremes in altitude and weather. The National Parks Service has provided the following weather information for Estes Park (7,522 ft) to the east, and Grand Lake (8,369 ft) to the west. These tables represent average temperatures and precipitation near the park’s entrance stations at the lower elevations in Rocky Mountain National Park. Keep in mind that year round the temperatures will be much lower and precipitation much greater at the higher elevations of the park. As we have mentioned in previous articles, your chances of finding a suitable campground in a national park are much better if you avoid weekends in high season and holidays in particular. Try to make reservations or show up on a weekday or early Friday if you want a spot in a central or popular campground. For the smaller, quieter, or more out-of-the-way campgrounds, show up at the park early in the day and make securing a campsite your first order of business. The busiest season in Rocky Mountain NP is summer when the campgrounds may be full even on weekdays. In autumn, during elk rut and fall colors, the campgrounds may be full on weekends. Note that just outside the park, private campgrounds near the town of Estes Park and the US Forest Service camps south on State Highway 7, may have campsites available; to the west on US 36 near Grand Lake, Shadow Mountain Lake, and Lake Grandby, there may also be openings on USFS land. There are five developed campgrounds in Rocky Mountain NP, four on the east and one on the west. 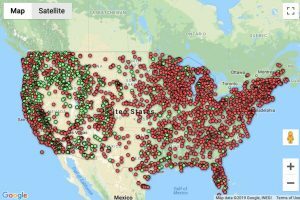 All the campgrounds are operated by the National Park Service and none has showers or hookups. In winter there is no water in the campgrounds. Let’s start by discussing the four campgrounds on the eastern side of the Continental Divide. The largest, very popular, and centrally located Moraine Park Campground is located close to the Beaver Meadows Entrance (US 36) near the start of scenic Bear Lake Road. Situated in a glaciated mountain meadow (a park), this campground is the start of many of RMNP finest hiking and horse trails. These trails, both short and long, flat and steep, lead to grassy parks, mountain streams, waterfalls, and glacial tarns. Also located within a short walk is the interesting Moraine Park Visitors’ Center and a shuttle bus stop. Even if you don’t camp here, drop in for sightseeing or a hike! About four miles farther up famous Bear Lake Road is Glacier Basin Campground. The views of the peaks and glaciers on the Continental Divide from Glacier Basin are simply stunning. As with Moraine Park CG, many great horse and hiking trails start here. The shuttle bus to the end of the road at Bear Lake also stops in Glacier Basin. A third campground, Aspenglen Campground, is located to the north near the Fall River Entrance (US34). This smaller CG is a no generators zone. Although not as centrally located for the best mountain hiking in RMNP, there are some interesting short trails. Plus, it is close to the start of Trail Ridge Road and the twisty, gravel (but OK for sedans) Fall River Road. Both lead to the Alpine Visitors’ Center at Fall River Pass (11,796 ft). Don’t miss this motor tour and the alpine views from the tundra! About ten mile to south of the resort town of Estes Park, on State Highway 7, is the very small and remote Long’s Peak Campground. If you don’t have a tent, you cannot stay here. Frequented mostly by the more rugged types, backpackers and mountaineers, this tents-only campground is the starting point for the long, steep trail to the summit of the park’s highpoint, Long’s Peak (14,259 ft). The trails start just past the rangers’ station. There is one campground on the west of the Continental Divide on US 36 after it descends from 12,000 foot elevations on Trail Ridge. 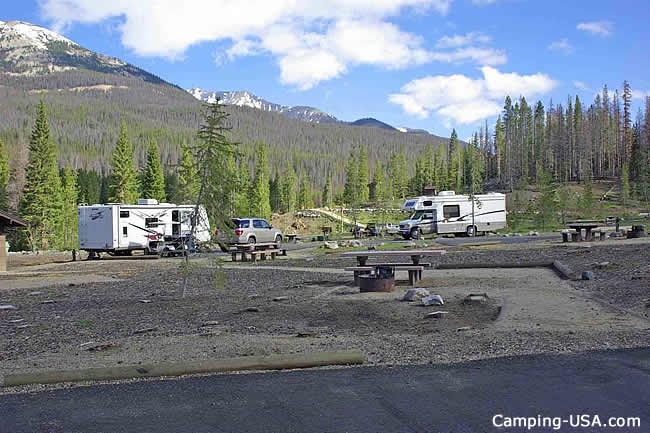 Located along the headwaters of the Colorado River, Timber Creek Campground is the place to be if you want to explore the western side of Rocky Mountain NP. No trails start at this campground but many trailheads, including the short, historic trail to Holwarth Dude Ranch, are a few minutes drive away. A longer drive, eight miles south, will get you to other foot trails, the Grand Lake Entrance, and the Kawuneeche Visitors’ Center. Rocky Mountain National Park has thousands of visitors in all seasons of the year. Three of the campgrounds (Moraine Park, Long’s Peak and Timber Creek) are now open year round for winter adventures. These include winter hiking, snow showing, skiing, and winter mountaineering. As the snow melts and the roads and trails clear, visitation to the park increases and the other campgrounds (Glacier Park and Aspenglen) open. Spring, summer and fall provide fine weather for birding, wildlife viewing, hiking, backpacking, mountaineering, rock climbing, and horse riding. Trail Ridge Road and Fall Creek Road provide adventurous drives and great views for the motor tourist. Others may prefer to leave their cars behind and take the free shuttle to the many trailheads along Bear Creek Road, or even ride it into Estes Park for a few hours of shopping or dining. I hope this brief guide will aid you in planning your camping trip to RMNP. Whether you plan to relax in your motor home or rough it in a tent, you will not be disappointed with Rocky Mountain National Park.